The tabs can be easily initialized on a web page, which makes building Ajax-based tabbed interfaces a breeze. Just assign any elements on your page (for example, divs) to the tabs of the dhtmlxTabbar, and it will automatically do all the work for you. The component will switch these elements, displaying them as the corresponding tab is clicked. Together with other DHTMLX components, the tab bar module offers another ready-to-use element for building Ajax-driven web apps. dhtmlxTabbar supports a single-command integration with the DHTMLX components and provides a unified API for assigning objects to tabs or detaching them from tabs. 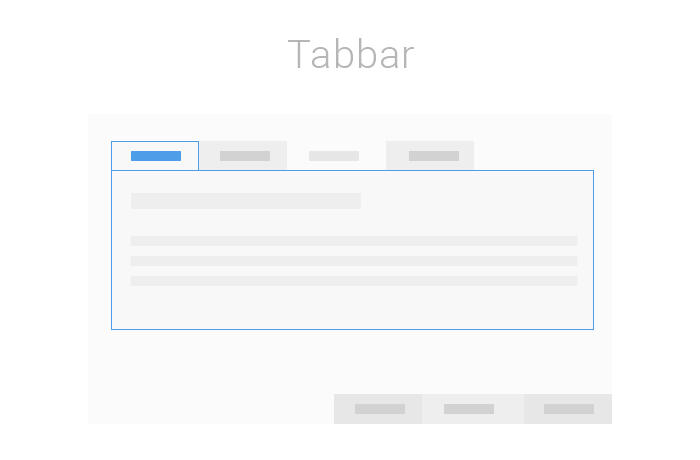 Our detailed documentation can learn how to use Tabbar and effectively implement it in your own applications. It provides the detailed information regarding each aspect of the widget.